Ganeau’s Index of Cyclic Equilibrium for 2010 to 2024. | Chaos Sweeps Away the World We Know! The Disaster, current events & Catastrophe Blog. Forecasts for 2014 to 2022. Read tomorrows news today! Plus current economic, commodities, stock indices and financial news. ← Heat Wave Stikes Western U.S. as Temps Approach 120. Ganeau’s Index of Cyclic Equilibrium for 2010 to 2024. 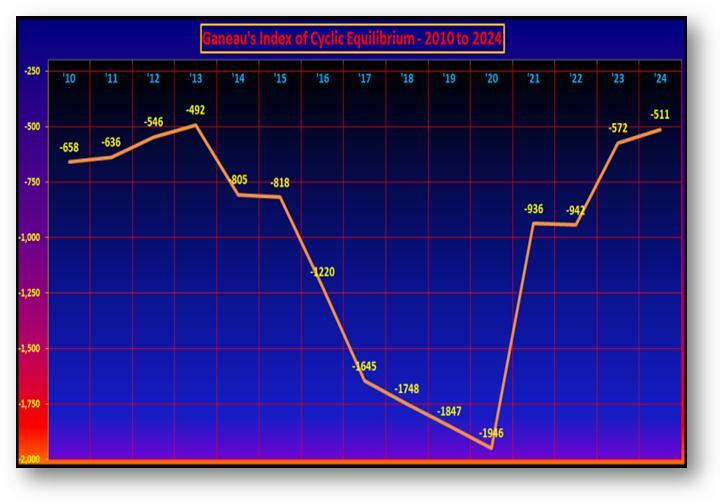 July 2, 2013 – Ganeau’s Index of Cyclic Equilibrium for 2010 to 2024: Claude Ganeau developed a method of determining periods on the earth that were positive or negative. He termed this his “Index of Cyclic Equilibrium.” The Ganeau Index of Cyclic Equilibrium for 15 years of the 21st century is shown above, and explained below. Consider this simple analogy. The Moon and Sun form a basic cycle of about a month. The word for “Month” comes from the Moon. A lunar month is 29 ½ days and is the period of a complete revolution of the moon around the earth. It is also called the synodic month, hence Moon equals Month. For centuries humans have measured time by the Moon’s cycle. The cycle begins with the new moon, when the sun and moon are conjunct. The waxing phase is from the new moon to the full moon, while the waning phase is from the full moon to the new moon. Traditionally, projects are started on new moons, are completed at the full moon and solidified during the waxing phase from full to new. The waxing phase is one of growth and positive vibrations, while the waning phase is one of decay and negative vibrations. Claude Ganeau applied this principle to the cycles of the outer planets, from Jupiter to Pluto. Using the pairings of these planets, he obtained 10 cycles as follows: (1) Jupiter/Saturn, (2) Jupiter/Uranus, (3) Jupiter/Neptune, (4) Jupiter/Pluto, (5) Saturn/Uranus, (6) Saturn/Neptune, (7) Saturn/Pluto, (8) Uranus/Neptune, (9) Uranus/Pluto and (10) Neptune/Pluto. The waxing phase of each pair was considered good (optimism, growth and constructive) while the waning phase was considered bad (pessimism, decay and destructive). Ganeau calculated this index for the 100 year period from January 1, 1900 to December 31, 1999; and found a remarkable correlation with the state of the world in terms of war and peace, prosperity and depression, and several other factors. For example, the index accurately forecast WWI, WWII, the Korean War and the Vietnam War. I calculated the Ganeau Index for January 1st for the years 2010 through 2024 and produced the Cyclic Equilibrium Index you see at the top of this page. The left scale reflects the sums of the 10 pairs of planets, in terms of their combined waxing or waning degree of separation. There is a direct correlation between how negative the Ganeau Index is and how bad conditions are on earth. The Ganeau Index of Equilibrium does not bode well for the future of planet earth. In July 2013, we stand at the edge of the abyss, as the Ganeau Index drops from -492 in 2013 to -1946 in 2020. The world is about to plunge into an era of significant earth changes on a biblical scale! This entry was posted in Apocalyse, Death, Disasters, Misc, Miscellaneous, Predictions and tagged astronomy, earth, Gan Index of Equilibrium 2010 to 2024, Ganeau Index, Jupiter, Korean War, Lunar month, lunar phase, Moon, new moon, Planet, Planets in astrology, pluto, Solar System, Sun, World War I, World War II. Bookmark the permalink. 3 Responses to Ganeau’s Index of Cyclic Equilibrium for 2010 to 2024. Could you provide a source of how to perform the Ganeau calculations? Are you familiar with the Barbault calculations? Are either of these, to your knowledge, connected to the work of Richard Tarnas? The Richard Tarnas document, “World Transits 2000 to 2020” was very good and, at 212 pages, very comprensive. I wish he had spent more time on the period between 2012 and 2020. I ran a scan from 2010 to 2020, for Jupiter to Pluto, and using the conjunction, opposition, trine and square aspects. It’s going to be a transformative and sometimes very difficult period. April 21/22, 2014 will see a “T” square with Jupiter in Cancer, Uranus in Aries and Pluto in Capricorn. Additionally, Mars and the Uranian planet Zeus are also involved in this configuation. It will be very difficult for the world. I obtained the methods used for the Ganeau & Barbault calculations from, “Mundane Astrology: An Introduction to the Astrology of Nations and Groups” by Nicholas Campion et. al. – page 171 to 174. This book references “Part 2 – The Planetary Cycles nad Their Interpretation” by Charles Harvey. I am familiar with the Barbault calculations and have graphs from 2000 to 2027. I recalculated Ganeau and Barbault and found mistakes in some authors. I, also. calculated Barbault’s Jupiter sub-set of New Discovers, Visions, Ideals and Social Trends; as well as his Saturn sub-set of Conservative & Discodant Forces. The URL on Afghanistan is interesting, however, I think he made some serious errors in the computation of Ganeau and Barbault’s work. I am reading Richard Tarnas’s, “World Transits 2000 to 2020” and will post my review in another comment to you.